Branchio-oto-renal (BOR) syndrome was first described by Melnick et al. and Fraser et al. It is characterized by branchial arch anomalies (branchial clefts, fistula, cysts), hearing impairment (malformation of auricle with preauricular sinuses, conductive, sensorineural, or mixed hearing impairment), and renal malformations (urinary tract malformation, renal hypoplasia or agenesis, renal hypoplasia, renal cysts). It is an autosomal dominant disorder and is seen in approximately 1 in 40,000 general population. Patients usually present with hearing impairment and branchial fistula. Such patients should be further investigated for BOR syndrome and thus control its progress. A 16-year-old male patient presented with left ear foul smelling discharge for the past 7 years associated with decrease in hearing in both ears. 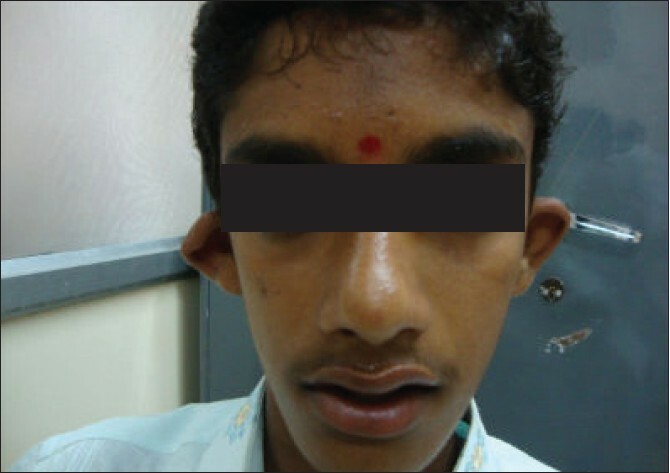 On examination, he had bilateral preauricular sinuses [Figure 1] and [Figure 2] and cup-shaped, low-lying deformity of right pinna [Figure 1] and [Figure 3]. Otoscopic examination showed right-sided posterosuperior, marginal tympanic membrane perforation with scanty, foul smelling purulent discharge. 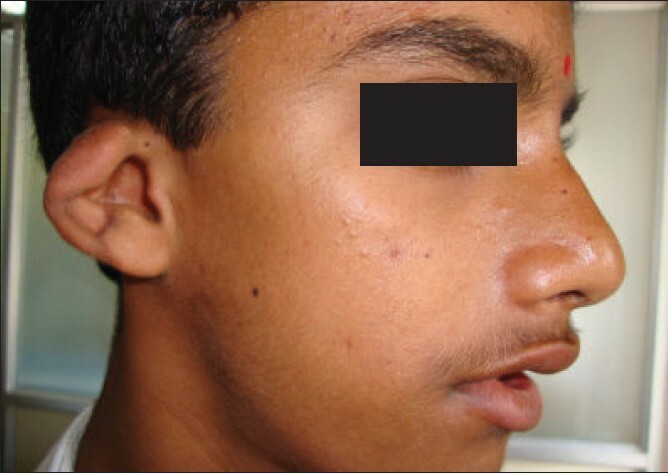 Patient also had bilateral branchial fistula [Figure 1] and [Figure 2]. Further questioning revealed that his mother also had similar complaints. Pure-tone audiometry was done which showed bilateral moderate-severe sensorineural hearing loss. Computed tomography (CT) scan of temporal bone showed soft tissue shadow filling the right middle ear cavity, with sclerosed mastoid and no bony destructions. His ultrasound abdomen investigation revealed left renal agenesis. He underwent modified radical mastoidectomy for extensive cholesteatoma filling the mastoid area and the middle ear, which had partially destroyed the malleus and incus. As patient had occasional discharge through branchial fistula, he refused surgical treatment for it. He is referred to a nephrologist for his renal anomaly and is on regular follow-up. BOR syndrome is an autosomal dominant disorder characterized by branchial arch anomalies, hearing impairment, and renal abnormalities. It was first described by Melnick et al. and Fraser et al.,  also called Melnick-Fraser syndrome. The prevalence approximates 1:40,000 in general population and has been reported in about 2% of deaf children. Previous linkage studies have localized a gene locus on chromosome 8q13. , Variability is seen in individuals in presence, severity, and type of involvement. Sticken et al. reported the frequencies of main features of BOR syndrome in which hearing impairment is seen in 95.4%, malformed auricles in 86.8%, second branchial arch fistula/cyst in 86.5%, preauricular sinus in 87%, and renal anomalies in 58.3%. 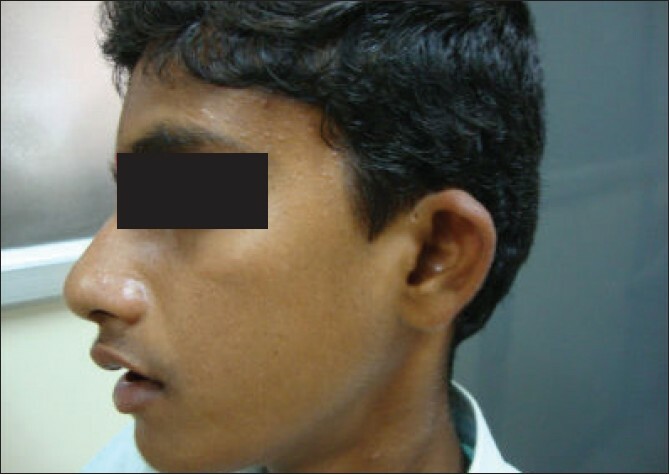 Second branchial arch anomalies present as branchial cleft sinus tract appearing as a pin-point opening anterior to the sternocleidomastoid muscle usually in lower third of the neck. They may also present as branchial cleft cyst appearing as palpable mass under the sternocleidomastoid muscle, usually above the level of hyoid bone. Otologic presentations are deafness, which may be mild to profound in degree, conductive, sensorineural or mixed in type, preauricular pits, auricular deformity, and preauricular tags. Abnormalities of external auditory canal are atresia or stenosis. Middle ear abnormalities are malformation, malposition, dislocation or fixation of ossicles, reduction in size, or malformation of middle ear space. Cochlea hypoplasia, enlargement of cochlea, and vestibular aqueduct and hypoplasia of lateral semicircular canal are inner ear abnormalities. Renal anomalies present as urinary tract malformations, renal agenesis, hypoplasia, dysplasia, hydronephrosis, and further progress to renal failures in adults. Early detection and further investigations of patients who present with features of BOR syndrome could prevent the potential severe long-term effects of it. Screening of relatives at risk should also be done to prevent its progression. 1. Melnick M, Bixler D, Nance WE, Silk K, Yune H. Failial branchio-oto-renal dysplasia: A new addition to the branchial arch syndromes. Clin Genet 1976;9:25-34. 2. Fraser FC, Sproule JR, Halal F. Frequency of the branchio-oto-renal (BOR) syndrome in children with profound hearing bloss. Am J Med Genet 1980;7:341-9. 3. Emrah FC, Hatice K, Fatih A, Guleser S, Basak NG, Saliha S. From a branchial fistula to a branchiootorenal syndrome: A case report and review of the literature. J Pediatr Surg 2009;44:623-5. 4. Fraser FC, Ling D, Clogg D, Nogrady B. Genetic aspects of the BOR syndrome - branchial fistula, ear pits, hearing loss and renal anomalies. Am J Med Genet 1978;2:241-54. 5. Hann EA, Hull YJ, White S, Cockington R, Charlton P, Callen DF. Tricho-rhino-phalangeal and branchio-oto syndrome in a family with an inherited rearrangement of chromosome 8q. Am J Med Genet 1989;32:490-4. 6. Ni L, Wagner MJ, Kimberling WJ, Pembrey ME, Grundfast KM, Kumar S, et al. Redefined localization of the branchio oto renal syndrome gene by linkage and haplotype analysis. Am J Med Genet 1994;51:176-84. 7. Stinckens C, Standaert L, Casselman JW, Huygen PL, Kumar S, van de Wallen J, et al. The presence of a widened vestibular aqueduct and progressive sensorineural hearing loss in the branchio-oto-renal syndrome. A family study. Int J Pediatr Otorhinolaryngol 2001;59:163-72.